Whether you're brand new to stitching or an advanced embroider, Katherine Shaughnessy's New Crewel 101 embroidery workshop is sure to be a perfect fit. 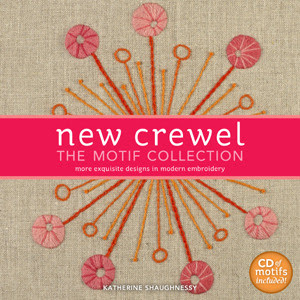 Shaughnessy is visiting Dallas on June 12 and will be stopping by Oil and Cotton with a trunk load of her unique crewel works and autographed copies of her latest book, New Crewel:The Motif Collection. Come and learn the basics of crewel embroidery including Shaughnessy's favorite and essential 'New Crewel' stitches, a little history, explanation of materials, finishing techniques and pattern transfer tricks. Participants will receive all the supplies needed to get started -- linen fabric, wool thread, needles and a hoop. Shaughnessy's Wool & Hoop kits, supplies and books featuring her original designs, dozens of fun projects and over 20 embroidery stitches, will be available for sale. For more information, call 214.942.0474. Visit www.oilandcotton.com to register.